Rave reviews abound on this skill-building, and life changing approach to working with consciousness and story. 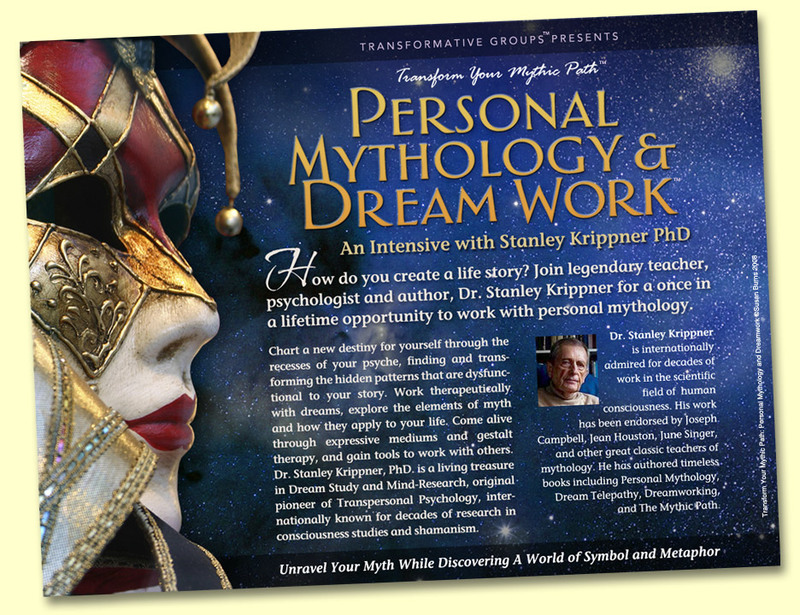 Dr. Krippner will capture your fascination of the archetypal, cultural, and transpersonal dimension of mythology while he guides you to integrate your inner mythical landscape using dream work, expressive arts, trance, ritual, intuition, and Gestalt work. 17 CECs Continuing Ed Credits -$20 paid on site. NBCC: The Association for Humanistic Psychology (AHP) is an NBCC-Approved Continuing Education Provider (ACEPTM) and a co-sponsor of this event. AHP may award NBCC-approved clock hours for event or programs that meet NBCC requirements. The ACEP maintains responsibility for the content of this event. As the Greek philosopher Epictetus wrote, many centuries ago, "It is not what happens to us that is important, it is how we react to what happens to us that is important." Personal mythology is an approach to personal transformation using the development of participants' personal stories about existential human issues for self healing and personal growth. There are also cultural, institutional, ethnic, and familial myths which influence our personal myths. We use our stories as personal myths. Often they can be found through our dreams, where we are often informed long before we know intellectually. There are four factors that influence personal myths: biology, culture, interpersonal experiences, and transpersonal experiences and how to work with them. By identifying, evaluating, and transforming dysfunctional myths, beliefs, and worldviews, and working with them you can transform them. Create A Vision For Your Future! This highly acclaimed experiential workshop intensive is an amazing opportunity to study with a highly respected and revered pioneer and world expert on shamanism, mythology, dream studies, and the scientific investigation of consciousness. He will guide you to find the story that is living through you and to see that the greatest opportunity for personal transformation is precisely in that which is no longer working for you. Learn experientially from a living treasure in Dream Study and Mind-Research, an original pioneer of Transpersonal Psychology. Discover a fascinating interplay of consciousness and mythology while becoming skillful with life changing methods to transforming personal story. Unravel your own mythic path and weave a new guiding myth of your life using dream work, expressive arts, trance, ritual, intuition, imagination, and Gestalt work. Transform the rich inner symbolic landscape of your psyche including changing the hidden, repeating dysfunctional patterns of your hidden story for a new story. From within your inner story, learn about the use of symbolism, shamanism, archetypes, animal totems, the precepts of myth and the transpersonal dimension to help others. NOTE: Currently (11/13/10) there may temporarily be some technical difficulty with online registration. Below are some of the books you will be able to obtain and have signed on site. Canadians can purchase Dr. Krippner's books at Banyen Books. These are some of Dr. Krippner's many books that will be available for sale at at the event. Dr. Krippner has also written among others: Dream Telepathy, Dreamworking, and Haunted by Combat. Read Personal Mythology: Using Ritual, Dreams, and Imagination to Discover Your Inner Story by David Feinstein, PhD and Stanley Krippner PhD - Introduction by Jean Houston. "A fresh and intriguing synthesis of a mythological perspective with contemporary psychological methods." "Personal myths structure our awareness and point us in the direction that becomes our path." For self healing & personal growth and for all those who heal others. This work is based on Krippner and Feinstein’s books/articles on dreams and personal mythology which draws upon the work of such writers as Carl Jung, Albert Ellis, Joseph Campbell, Jean Houston, Ram Dass, Dan McAdams, June Singer, and Stanislav and Christina Grof. 1) Personal Myths are those beliefs and worldviews that consciously or unconsciously influence our clients decisions and give meaning to their lives. 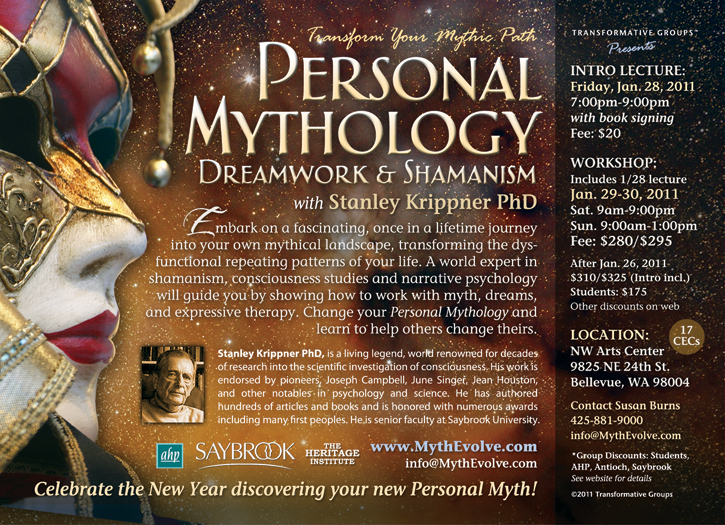 You will learn how personal myths are formed, continue to develop, and shape ones lives. 2) Some of these myths are helpful and some are harmful. Learn to identify influences on clients’ personal myth: biology, culture, interpersonal experiences, and transpersonal experiences. Learn how the technology of shaping personal myth would apply to the development of clients’ personal growth and development. 3) Learn how to evaluate and transform dysfunctional myths, beliefs, and worldviews and, develop a set of skills to continue this inner work, and to apply the tools of this technology to helping clients. The workshop uses a variety of exercises (artwork, movement, and Gestalt techniques) are some of the exercises to demonstrate what's involved in changing a dysfunctional myth into one that functions well in a person’s life. Learn to identify/work with personal myth for your healing or to guide your patients, clients, students. Dr. Krippner offered a great deal of very pertinent information for psychotherapists, counselors, psychologists in a kind of compassionate manner. It was possible to work on personal growth and personal issues while learning new techniques and accomplishing CECs. This all took place in a beautiful environment with a great support team. This has been a remarkable and joyous experience. Dr. Krippner is a true wisdom keeper. Stanley is a wisdom keeper and a world treasure. In his hands, I have discovered and grown. He is gentle and great fun! I wouldn’t have missed this experience for the world. He is so full of knowledge. Decades of wisdom and tradition pour out of him – a National Treasure. This workshop filled a need in me for some guidance. What better way to get this guidance than from my own inner myths. I understand more about myself and in a way I can relate to. The workshop was well organized and flowed smoothly. Dr. Stanley was/is wonderful, charming, and vastly knowledgeable. He gave me permission to do my work. I love Stanley’ stories and how he genuinely cares about people. This has been a delightfully inspiring workshop experience from a Master who is extraordinarily gifted in his field. His extensive knowledge combined with his powerful way to tell stories has been very engaging for me. I intend to explore the application of the content of this workshop with the children on the autism spectrum whom I serve. 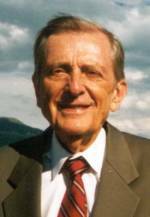 Stanley Krippner is a very wise man with an accepting, compassionate interpersonal style. This led us through steps to discovering our personal mythology with grace and good humor. I greatly appreciated the opportunity to begin this work with him. I was able to identify what I always wanted. Discovering my myth gave me the courage and conviction to begin a new life immediately. Dr. Krippner’s workshop has had an extraordinarily positive impact on my life! When I took his class, I had been working on a book project for several years. After his workshop, my motivation to complete my book increased dramatically and six months later I was a published author! The personal mythology workshop arrived at just the right time in my life and I am very grateful to Dr. Krippner for sharing his life’s work with the world. Stanley Krippner, Ph.D., professor of psychology at Saybrook Graduate School, San Francisco, is a Fellow in four APA divisions, and past-president of two divisions (30 and 32). Formerly, he was director of the Kent State University Child Study Center, Kent OH, and the Maimonides Medical Center Dream Research Laboratory, in Brooklyn NY. He is co-author of Extraordinary Dreams (SUNY, 2002), The Mythic Path, 3rd ed. (Energy Psychology Press, 2006), and Haunted by Combat: Understanding PTSD in War Veterans (Greenwood, 2007), and co-editor of Healing Tales (Puente, 2007), Healing Stories (Puente, 2007), The Psychological Impact of War on Civilians: An International Perspective (Greenwood, 2003), Varieties of Anomalous Experience: Examining the Scientific Evidence (APA, 2000), and many other books.